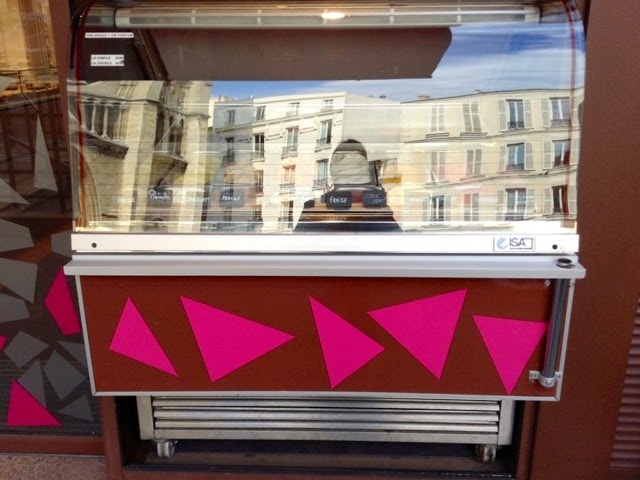 paris breakfasts: Cup or Cone? Cow or Sheep? Cup or Cone? Cow or Sheep? 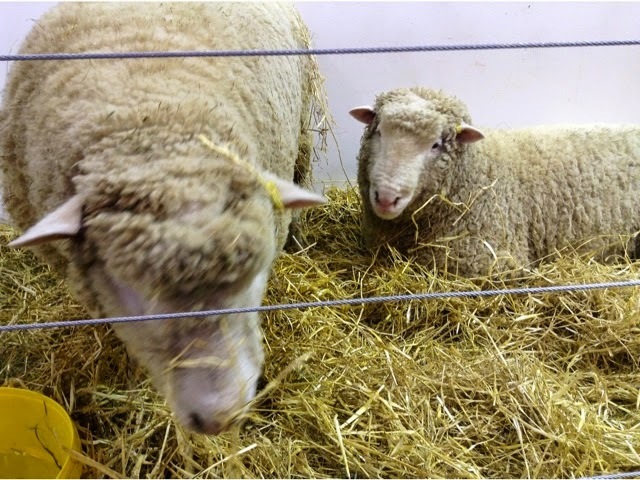 Have you tasted sheep's (brebis) milk ice cream? 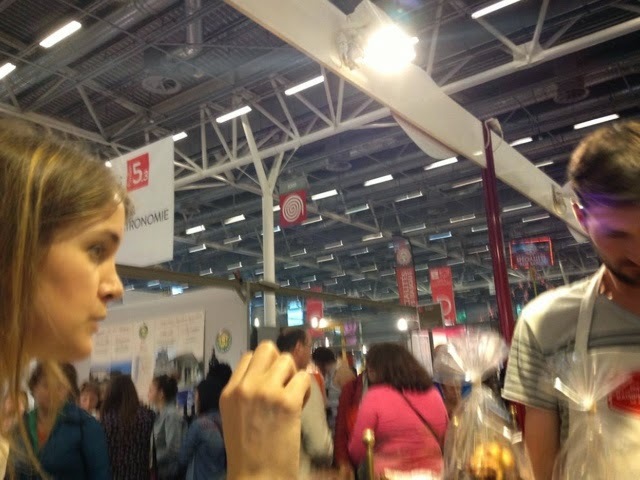 Solli and I lapped it up at the Salon de l'Agricuture - it's less sugary and richer tasting. 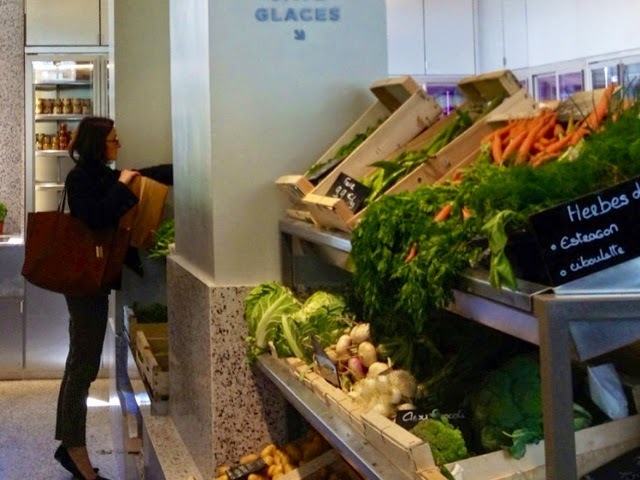 When I saw the brand new epicerie Maison Plisson was going to feature sheep's milk ice cream I ran over last Saturday. 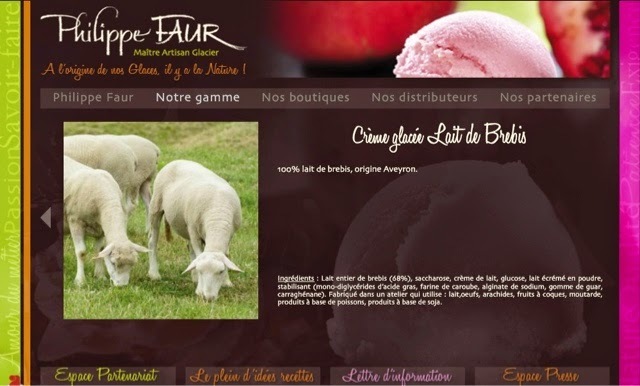 La glace au lait de brebis de Philippe Faur. 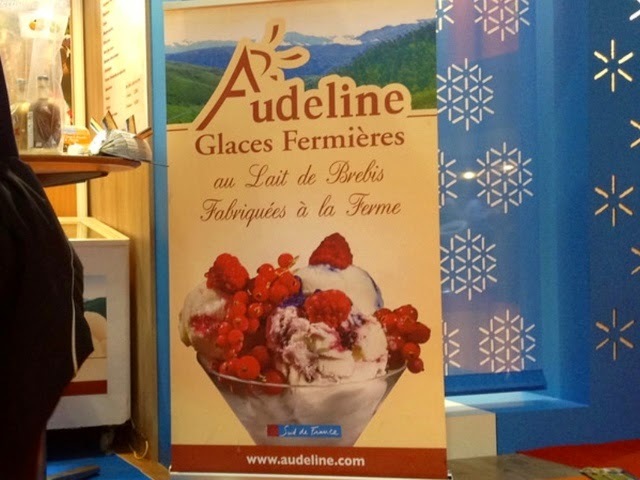 Ce maître artisan glacier ariégeois a conçu plus de 120 parfums depuis 1998, dont une surprenante gamme salée et cette crème glacée 100 % lait de brebis de l'Aveyron. The words GLACES jumped out at me! I ran downstairs salivating, dreaming of a cone. On Tuesday I had a 10:00 am appointment in my old turf Belleville. Naturally I passed by the wonderful La Patisserie de l'Eglise. Their ice cream counter was out! I hesitated...but can one really eat ice cream this early in the morning? Those long-standing members of I.C.A. (Ice Cream Anonymous) have rules about not indulging early in the morning sadly.Next time. 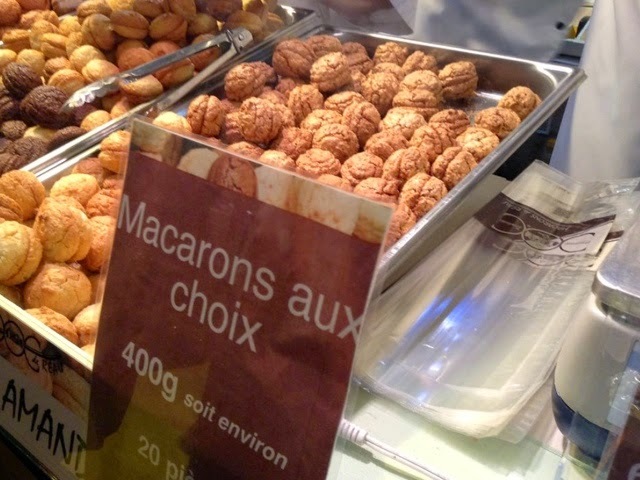 Her favorite organic macaron makers, Macarons de Réau, were at the foire. 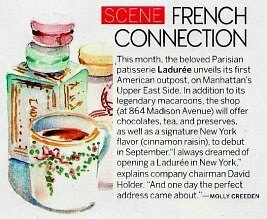 Not only do they make macarons the old-fashioned way and they are as pure as driven snow or Solli wouldn't be eating them. recipe for macglace on their own) laced with macarons in every delicious flavor like cookies and cream - MacGlace! 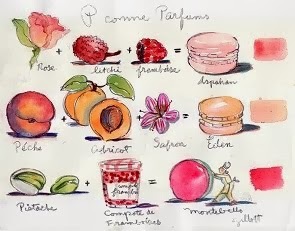 Grand Marnier et ses morceaux de macarons. The owner insisted we taste it on the house! 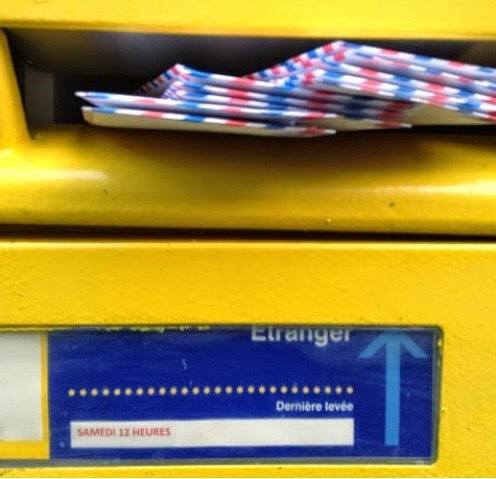 I am fascinated by the variety of cone shapes you see in France. 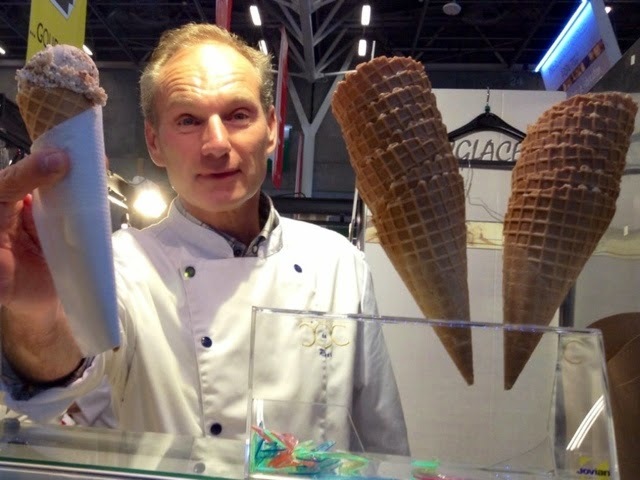 According to pastry expert Caroline Mignot in her book, My Sweet Paris we might not be getting the true taste of ice cream if we eat it in a cone. Who knew? Caroline's book has become my go-to bible on Paris pastry info. Her taste buds are highly refined in my opinion and I like that she makes specific suggestions for each patisserie. You become more adventurous no? 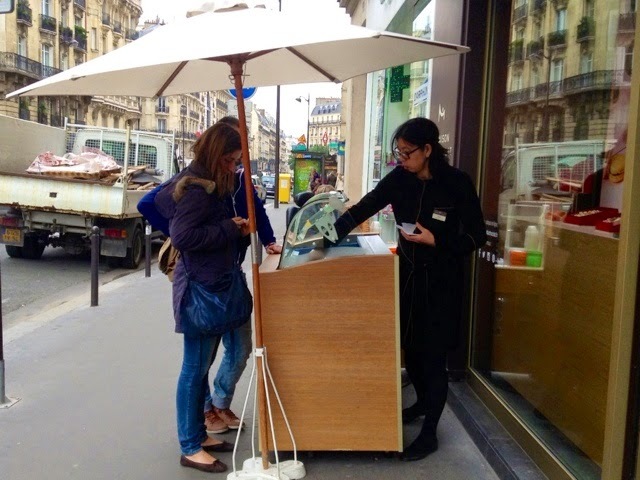 Yesterday I was walking along rue de Sevres, minding my own business when I stopped dead in my tracks by Maison du Chocolat's ice cream counter outside. It was gloomy, overcast, a bit chilly. Absolutely no reason to have a sun umbrella up. Still it's never too chilly for ice cream for some of us members of I.C.A. And it was afternoon so OK to indulge. 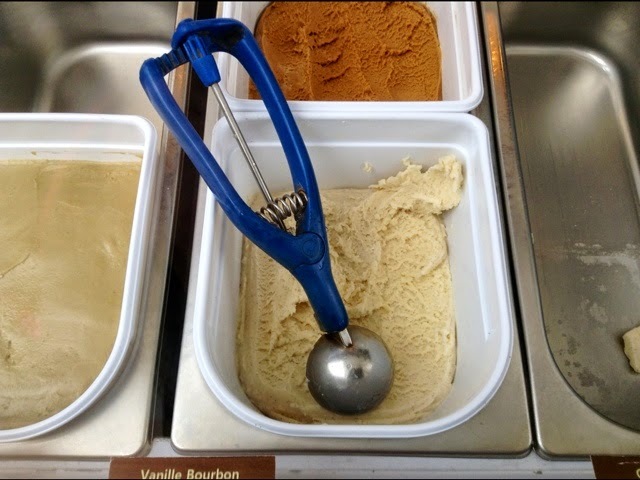 My old favorite flavor at La Maison is their salted caramel. 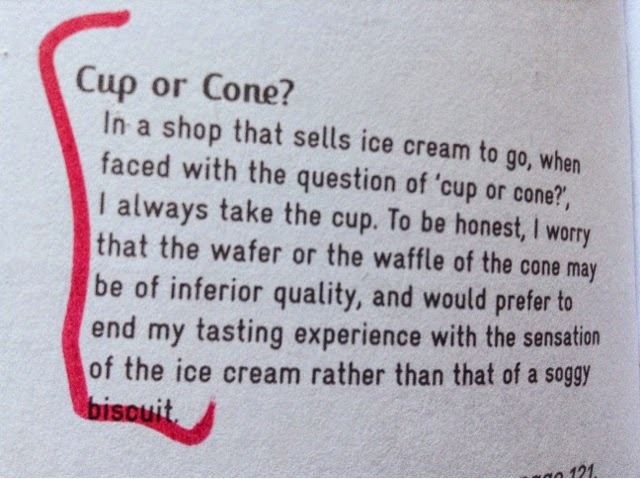 A cup or a cone, that is the question. Whether 'tis better to do as Caroline recommends? Normally I always get a cone. A cup it was and hence forth will be in the future. I must become more serious about my ice cream-eating. 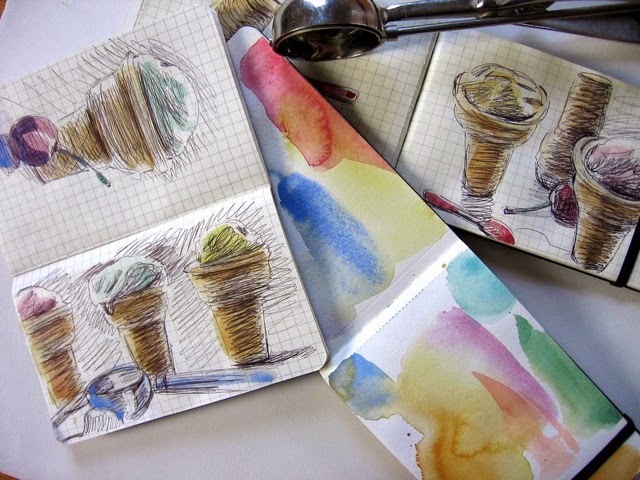 I will be painting ice cream in the future sans cone FYI. 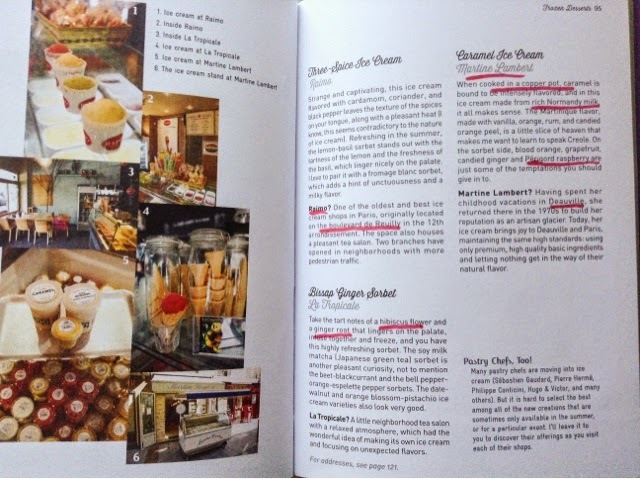 By the way did you know there are ice cream recipes in Jill Colonna's new TeaTime in Paris book? And you don't need a machine to make her Rose ice cream. If you're in Paris next Wednesday afternoon, 20th of May, please come to the booksigning/teaparty at Treize for Jill. More info here. I adore those organic macarons! The best. They will be happy for the mention. So addictive. are there any other flavors? You have such joie de vivre Carol.. 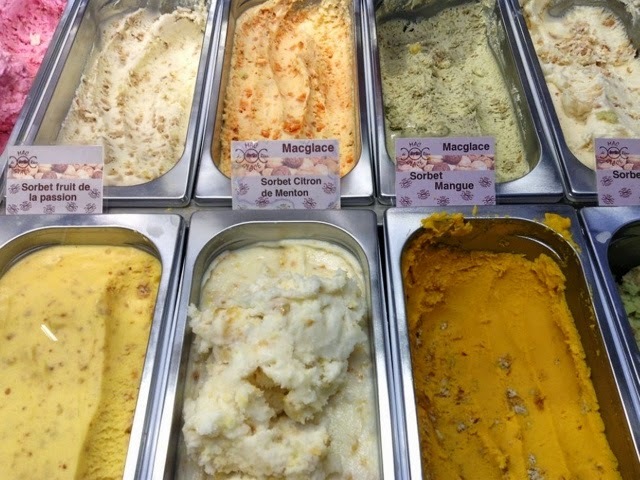 I'll take the MacGlace! Can't wait to see you at the Teatime Event on Wednesday, Carol. 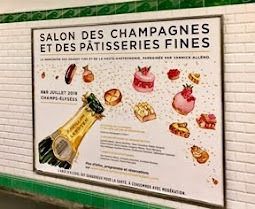 There won't be sheep's ice cream but there will be éclairs, choux puffs, tartlets, macarons, drinks ... and of course, ticket includes the book. Really looking forward to it - it's going to be a lovely afternoon! What a precious series this morning to wake up to! Your blog and your art have added a scoop of happiness to my days...thank you! We are way behind on our ice cream tasting & only have 5 days left as we've been concentrating on eclairs and macarons. Love this topic and your water colors at the end. What a treat. Really! I had no idea. A wonderful piece of information Nancy. why is it forbidden to eat ice cream in the morning? it's a dairy product -- perfect for any (or all) meals of the day! 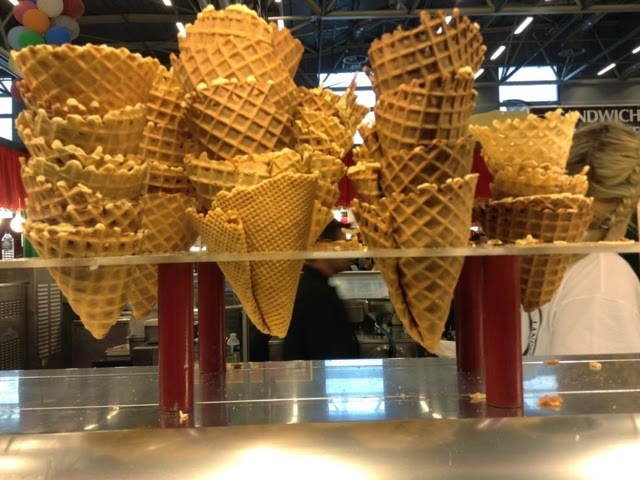 Has to be a cone for me , especially the waffle type ones. A very tasty and creamy post, Carol. YUM. Love the Wayne Theibaud-like cone sketches, at the end. As to cones - not for me; not because they get soggy but because they can crumble and the ice cream topples to the ground. A cup any day. Your shot of the ice cream guy handing the cone to the camera is a perfect photo - the sharpness, the lighting, his expression; perfect photo, Carol! HAPPY BIRTHDAY MAY 17. 2015! 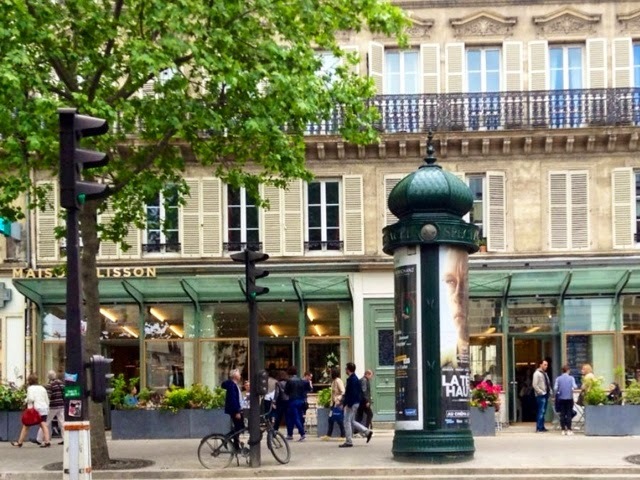 It seems like ages ago that we celebrated your birthday in that charming Parisian cafe. I hope you have a really fun time of it tomorrow. P.S. 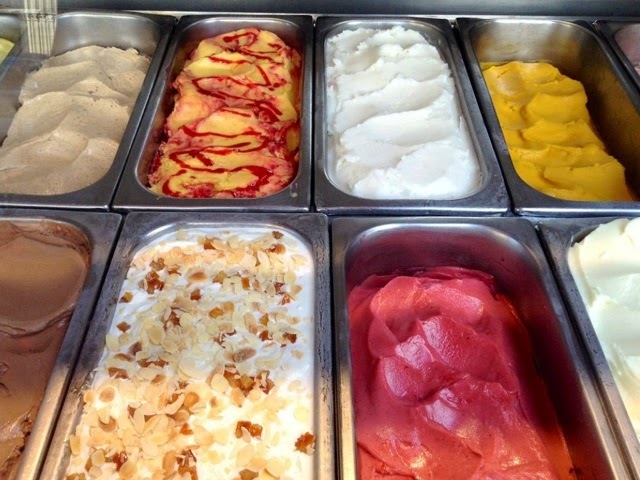 Indulge in some of that super special ice cream. What a delectable ice-cream post. I don't know that I've had brebis ice-cream. 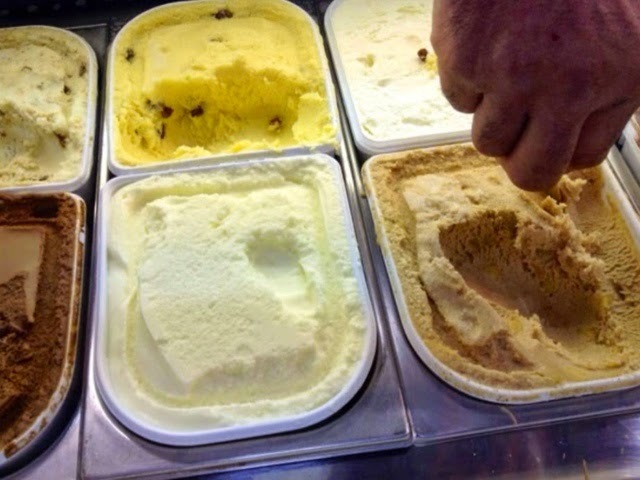 I had ice-cream made from goat milk once but found it rather grainy, not sure if that's a common problem. I've bought Caroline's book on your advice but haven't got to reading it yet. I do agree with her on cups over cones though. I gave up cones quite a few years ago- they are so often dry and dusty (well at least here) and not worth the calories. Plus in a cup you get just the flavour of the ice-cream. I remember getting a cone once at Amorino because they make such a pretty flower with their ice-cream, it's too beautiful. I can't remember what they do with a cone. 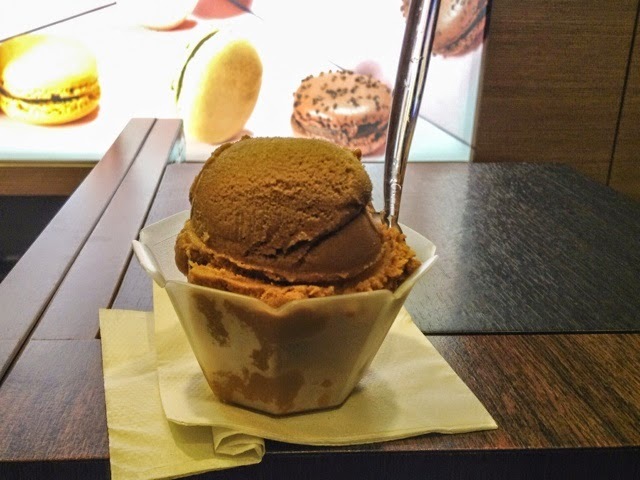 I did groan at your mention of Maison du Chocolat's Salted Caramel ice-cream. I can only imagine how divine that is. I had an ice-cream today in a cup obviously (despite the "winter" in Sydney) Caramelised White Chocolate and Dulce de Leche. I am right on the same page as Caroline! I fact, I rarely like ice creams with pieces of cookie or candy in them...those inclusions detract from the creaminess of the ice cream. 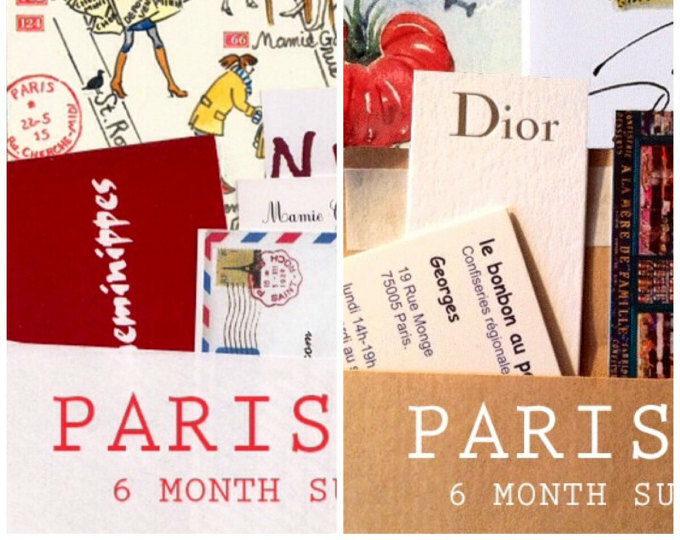 You've Got Paris Maps in your mailbox!